A romantic gift idea for her. It is presented with a certificate of authenticity. 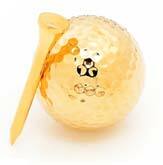 With a brilliant fine gold finish, this gift is a meaningful symbol of love that will last an eternity. 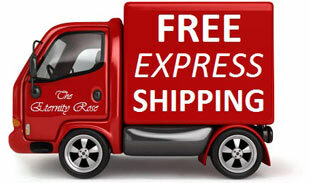 We provide fast & free express delivery. NOTE: This item does not come with a display case or vase. Vase may be purchased as a separate item here. 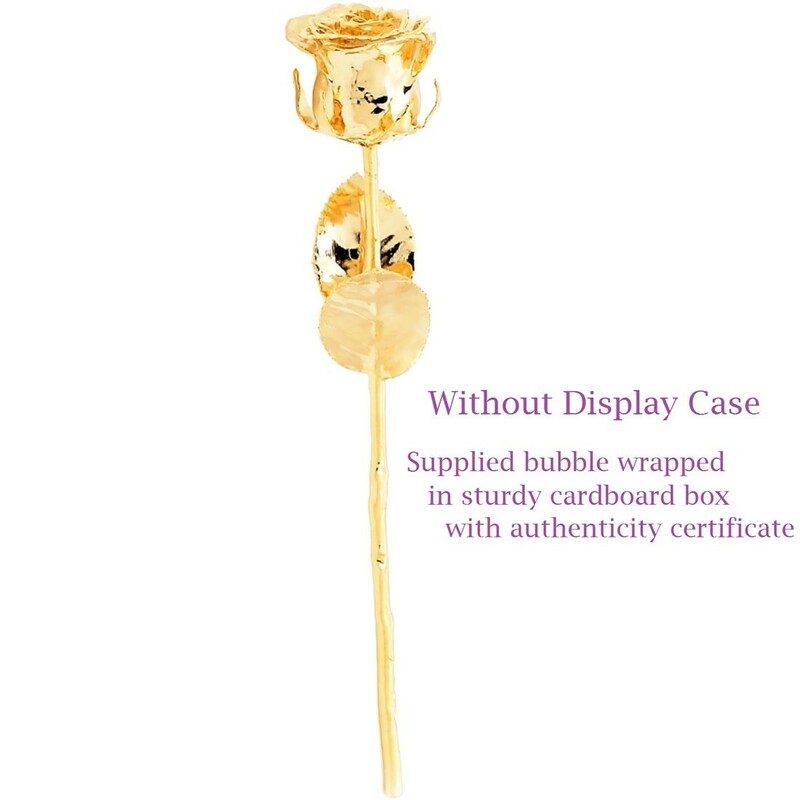 It comes bubble wraped in a sturdy cardboard carton, and includes a certificate of authenticity. As a long-standing symbol of love, passion, and beauty, the rose has a deep history of being the most treasured of all flowers. 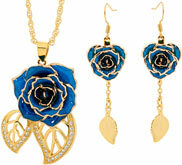 Invoking emotion and unveiling sincere love, a rose is powerful… and when paired with gold, it is even more so. 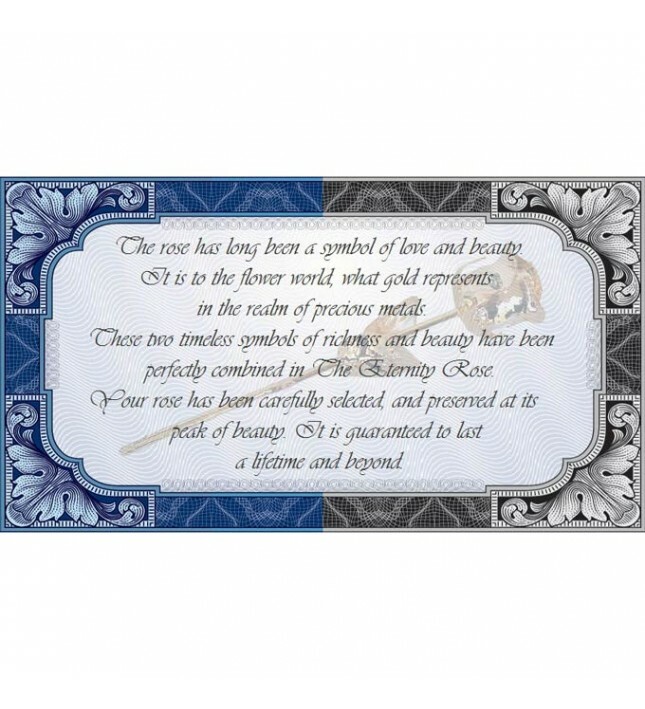 Both gold and roses have been revered throughout human history and immortalized in our literature and art. As timeless symbols of splendor, it is no wonder that combining these two elements would create such a flawless, perfect gift – and we have achieved just this. 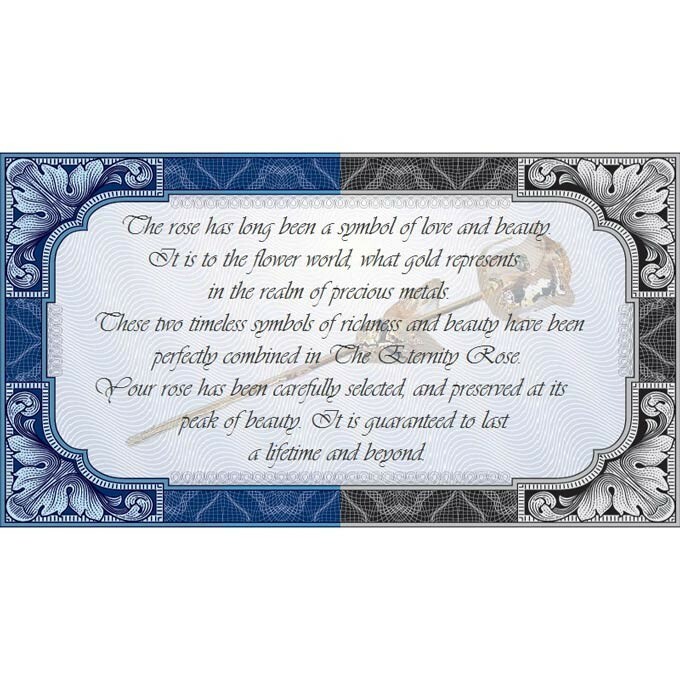 The “Eternity Rose” is a gilded masterpiece that will endure into eternity, making it a unique gift for a woman in your life which she can enjoy, display, and be proud of for a lifetime. A stunning gold Eternity Rose is sure to impress your loved one no matter when it’s given; whether it’s offered as a birthday gift, for Mother’s Day, as a graduation present, or given on that special day of love, Valentine’s Day. 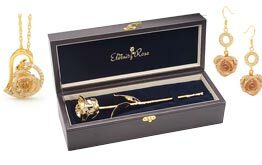 Plus, since our roses are dipped in pure 24 karat gold, they offer you a striking alternative to typical Golden Anniversary gifts, so you can celebrate your 50th Wedding Anniversary with the same kind of romance you both shared when you first got married. 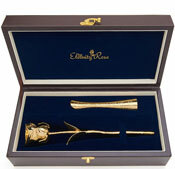 As a highly impressive gift, our customers have said it best: The Eternity Rose is a complete, all-in-one present. 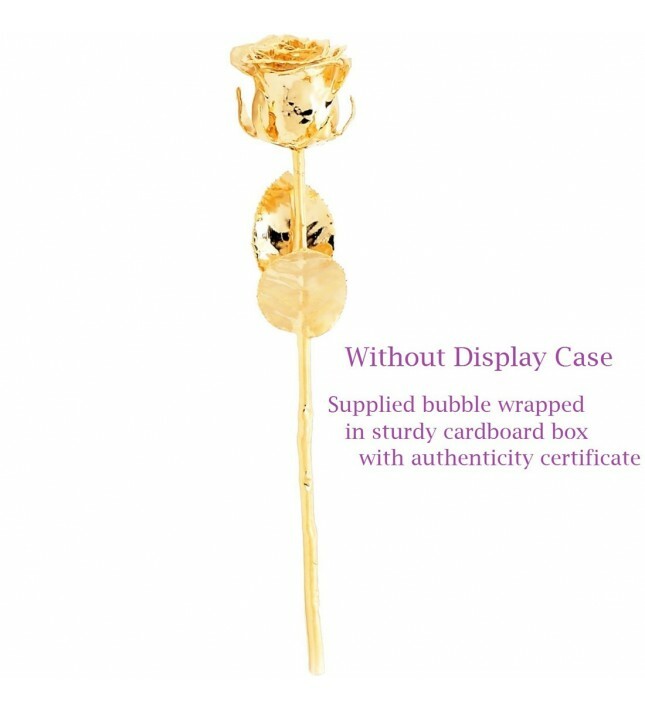 It combines the elegance and perfection of nature's most perfect flower, while allowing you to experience the luxury of 24 karat gold. When it comes to the expression of love, nothing states it better than a single rose. 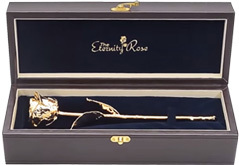 “The Eternity Rose” was indeed inspired by love, and that’s why we took the single rose and turned it into a masterful work of art – a symbol that may be displayed indefinitely as a reminder of your love. When you order one of our Eternity Roses, you will receive a natural rose – one that has been cultivated and cared for in our very own nursery. We spare no expense when it comes to developing the most perfect flowers, and we have trained horticulturalists on staff to make certain this happens. Each flower is watched with discrimination, as only the most beautiful of all the roses are selected, just as they being to open. It is then, right at the peak of the flower’s budding beauty, where the process of preserving the flower in gold begins. In order to achieve the quality that The Eternity Rose provides, the freshly picked flower progresses through a 60-step procedure. We have spent over nine years developing this complicated and difficult procedure. This is why we have no competitors who can produce anywhere near the quality we achieve. 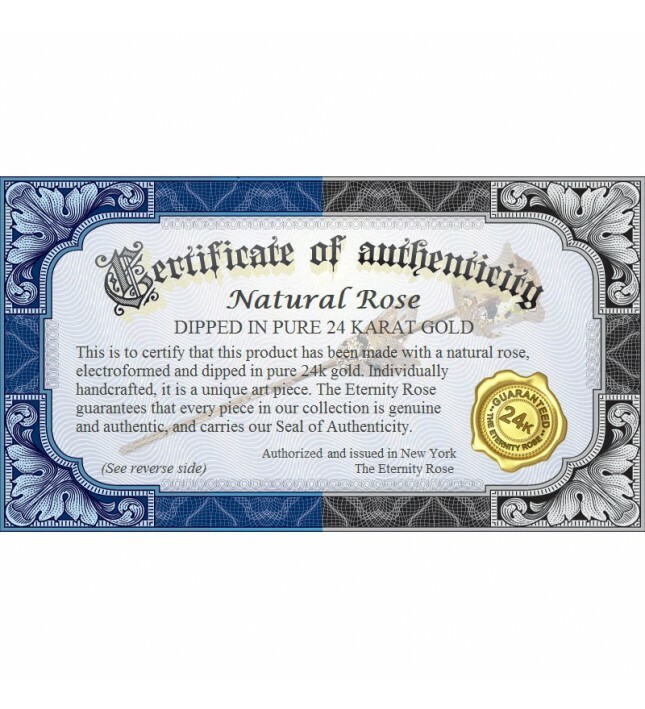 Through a process called immersion electroforming, we utilize both proprietary formulas and detailed processes which initially layer the rose with pure copper in order to ensure the rose’s integrity is preserved. This copper provides a texture-sensitive layer required to maintain exquisite detail, and a compatible base for precious metals to adhere to. Following its light copper coating, it is then dipped in nickel to give it strength and additional structural integrity. 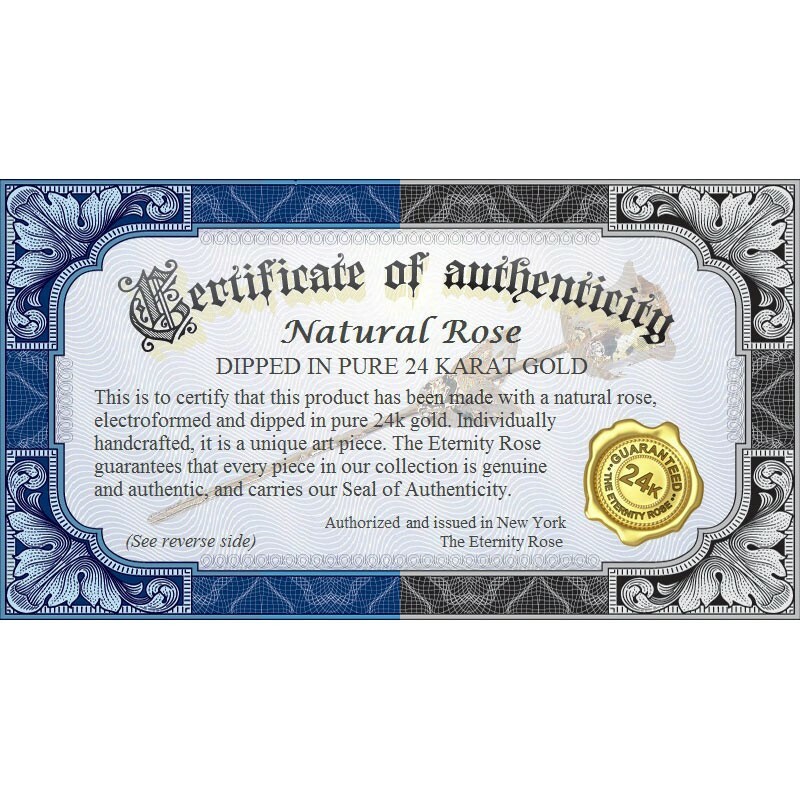 We have stringent quality controls and check for imperfections with each layer, so no rose makes it to the final gold-dipping stage without extensive screening. Only after it has been screened and approved is it then allowed to move into its final destination: the 24 karat gold-dipping baths. The whole process of delicately adding layer upon layer of precious metal to the single rose takes weeks. Extremely thin layers are added over time, giving the rose its signature mirror finish, an incomparable lustre, and a brilliant finish. The entire process takes about three months, but the results are impressive. The Eternity Rose will literally last for thousands of years, and it will never corrode under normal display circumstances. When you give a gold-dipped Eternity Rose, you are declaring a very special aspect of your love: immortality.